Minda Harts will never forget the day she learned there was more to success in the workplace than working hard. After reaching a certain point in her career, another woman pulled her aside. The woman told her she needed to look the part by investing in expensive shoes, suits and hairstyles. Harts says once she made the suggested changes her career took off. “The work I was doing was great, but once I matched it with my dress, and all of those other things, it’s amazing how much more I was worth in the eyes of the powers that be,” she says. 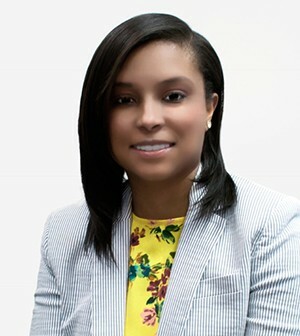 “But you don’t know those things.” This realization was one of many that spurred Harts and Lauren Broussard to launch The Memo, a career development bootcamp specifically for women of color. The woman who helped Minda happened to be white. Harts, like many women of color, entered the corporate world with no frame of reference to draw on. She was a first-generation college student and her family faced financial struggles throughout her childhood. It was up to her to figure out how to get to college and get a good job. Entering the workplace after college meant entering a world with social cues and etiquette that were foreign to her. Harts is thankful that other women stepped up and offered her guidance. Now, Harts’ Memo is on a mission to make sure other women of color get the scoop on the secret language of the workplace. But just as important as seeing yourself in others is being seen by others. Harts says the impact on the speakers is profound. “It’s not something that they’re reading in The New Yorker or The Atlantic. They’re actually sitting down, having conversations, listening to Mary talk about a time where she was overlooked for a promotion five times. Yet, she’s the go-to person. Stories like that that they need to hear.” This cross-pollination helps keep women of color and their unique challenges at the forefront because they aren’t the only ones who need to get the memo.